Presented for your viewing pleasure, or otherwise as the case may be, are six watches, each with something just that bit different about them. You won’t find these on too many people’s wrists, some with good reason. I have had an interest in the more off-beat watches for a while, collecting the odd example as the opportunity arose. The watches presented are not expensive, in fact they are all quite inexpensive, and are interesting in their own ways. There has been great endeavor by watch designers, and watch companies, over the years to catch the public’s attention with something different, something new. Some companies have simply embellished the conventional watch designs, adding features to the dial or case, even removing the dial altogether, as with skeleton watches and the popular Bulova Spaceview tuning fork watches. No, I don’t include a Spaceview here, but there is a Skeleton in the closet. Another way in which companies have vied for the fickle public dollar is to utilize novel time display methods. Jumping Hours and Direct Read Digital watches present the time in a different format. You’ll find a couple of these below. Apart from novel methods of time display, the companies also got to the root of the matter, altering the basics, moving away from the conventional mechanical movement. The Space Race was on, automobiles sported fins better suited to jet aircraft, electrical appliances revolutionized housekeeping, and Electric movements were hoped to revolutionize watches. You’ll find an example of the ill-fated Hamilton Electrics below. Not all watches are made in Switzerland or Japan. 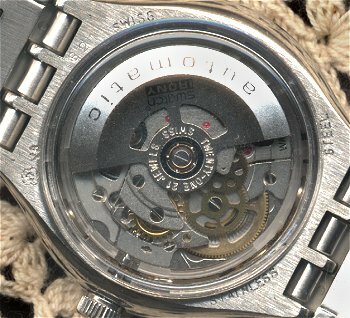 There are more esoteric sources, not quite so well known, but manufacturing watches in huge numbers. In some of these the mechanical watch still holds it’s place. There is Orient in Brazil, Poljot and others in Russia, and HMT in India. HMT? Read on. Yes, read on, and spend a little time in the company of the not quite so common. I hope you will gain some enjoyment. This is a current production Irony automatic . The “Body & Soul” name I assume, referring to the ability of the skeletonised watch to show its innermost workings, and perhaps the wearers also – a peek into your soul? Swatch’s heart. Manually winding from the crown, the watch allows you to see the winding train in operation, including the mainspring in its barrel, a sight not often seen. The case and bracelet are made of stainless steel, quite well done considering the price level of the watch. Both the front and rear crystals are acrylic. By the way, this is a “octuple” signed watch. No triple or even quadruple signing for this baby! Four of those signings are on the bezel alone! Swatch sure don’t want anyone wondering who made this thing. One possible problem with this watch is that it can be difficult to precisely tell the time, as there are absolutely no time markings on the bezel or crystal. I can see why a lot of the Bulova Spaceviews had either a residual chapter ring, or markers engraved on the crystal itself. 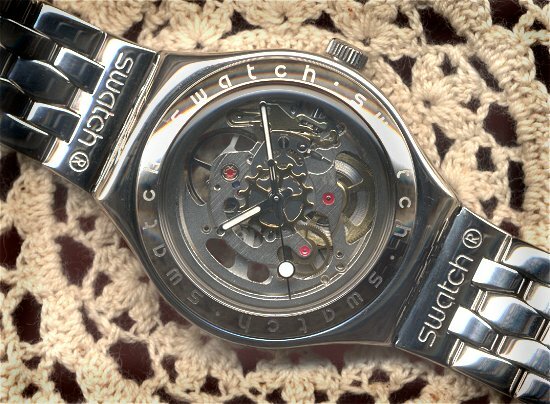 However, most skeleton watches I have seen suffer from readability problems to a greater or lesser degree. Its a price you pay for the novelty of being able to gaze upon the inner secrets unhindered. The Swatch does at least have highly visible hour and minute hands, picked out with white inserts, and a large white dot on the second hand that seems to float magically around the dial. I’m sure we spend a fair amount of time admiring our watches off our wrists. For actual daily wear, however, the skeleton has the edge on exposing itself. Caravelle watches are manufactured by Bulova, and carry their dating system. This watch is marked “N3″, which is Bulova-speak for 1973. 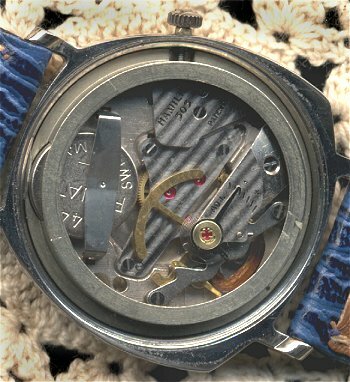 Even if you didn’t understand the date markings on the case, the damn case itself is probably a dead-giveaway to the era this watch was made in! These big cushion cases scream 1970s, cool, groovy, and all the hangovers of the hippy era. It really should be on one of those 2 inch wide embossed leather straps. Its a style of case you either love or hate. I don’t mind them. The watch is what is known as a Digital Mechanical. The time display consists of a large jumping hour, and wandering minute & seconds dials. In effect you are supposed to read the time from left to right – hours, minutes, seconds. The jumping hour numerals snap over with an audible click, admirably close to the actual hour. You can even feel the hour clicking over on your wrist. The case is chrome over base metal, with a SS screwback. 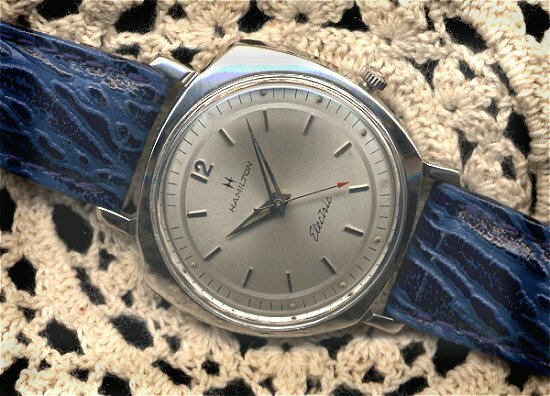 A striated effect has been applied to the top of the case, a common decoration found on 1970s watches. The dial is a deep blue, and the crystal is acrylic. It is quite a stunning watch, and yet, could even said to be somewhat restrained in its “ugliness” when compared to some other 1970s digital watches I have. I have found that most people, upon first seeing this strange watch, immediately take the big hour display to be the date (even when it doesn’t match the actual date of the month). They then have a heck of a time trying to figure out the time from the remaining minute & seconds display. Sometimes I even explain their error to them, depending upon whether they had said anything derogatory about the watch’s aesthetic properties. In fact readability is one of the biggest problems of most digital/direct read watches. It is not an intuitive method of time display, and even though it could be though of as akin to the digital display on a LED or LCD quartz watch, in reality, the mechanicals are harder to read. The fact of the wandering minutes means that very often there is no numeral directly in line with the pointer, and some interpretation is required on the part of the wearer. I have worn this particular watch for a week at a time, just to see if I became accustomed to reading the time quickly. I cant say it ever even approached the one glance readability of a conventional analogue display, but I did get better at it as time went on. No doubt if such a watch was worn continuously you could get the hang of it. I cant say that I know a heck of a lot about the Endura brand. I do know that they are now lumped in with the Swatch Group (formerly SMH). I have seen this particular watch under a number of different labels, so it is possible that the basic watch was purchased by various Swiss companies and labeled with their logo. The watch is a rather unusual example of a direct read dial combined with a conventional sweep second-hand. I would assume this timepiece dates from the 1970s. Well, I have to say that this is definitely the most unreadable watch in my collection. The various components of the display are much too separated, and their windows and markers so small, that it is an exercise in study to interpret the time. There is also the added confusion of the date window at the 6 o’clock position. The hour indicator at the 12 o’clock position, and the minutes in the arc under the center post are both of the wandering variety. The non-intuitive time displays of such watches probably doomed them to be unsuccessful. As with most digital/direct read displays, they lack the ability to afford an instant picture of the time. A conventional analogue dial, with hands, gives us a quick visual indication of where we are in the day, even if we don’t get the exact time. At a glance you can see that it is morning, afternoon, nearly time for lunch. The direct read would not be a good timepiece for a habitual clock watcher. It seems the designers of the Endura understood the problems of reading such a watch, and tried to help out, at least a little. Each numeral in the hour display is repeated twice, once in black, once in red. The black numerals denote the hour, and the red numerals the half hour. Similarly, the arced minute display shows black numerals from 0 to 29, and red from 30 to 59. Its an attempt to give a visual clue that you are either past, or coming up to an hour, a matter which is not always clear on a direct read dial. The case is gold plated over base metal, with a SS snapback. The movement is a very basic Swiss 1 jewel slow beat , and it sounds more like a clock than a watch movement. It does, however, run well and keep reasonable time. 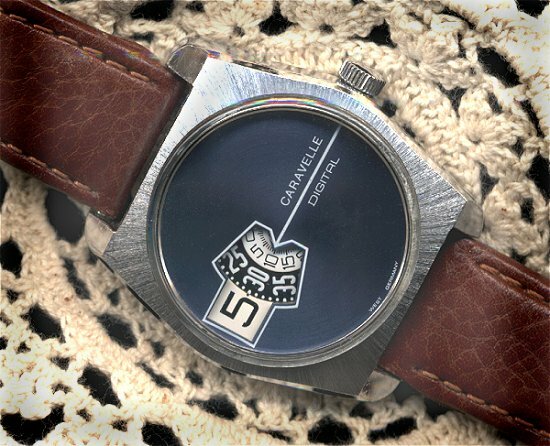 Rather appropriately, the watch came on a brown leather strap with holes punched though it, in true 70s (lack of) style! 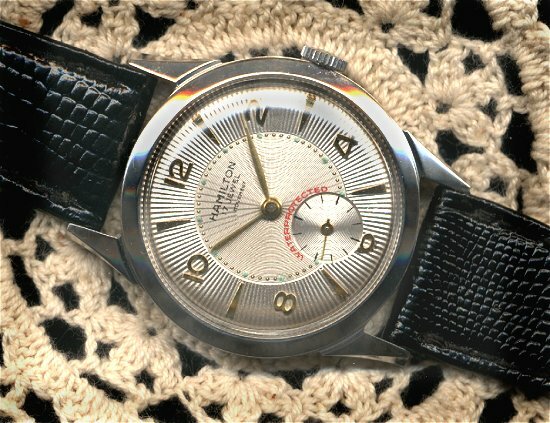 I am unsure of the exact date of manufacture of this Hamilton Sea-Lectric II. Unfortunately, Hamilton did not keep production details for these watches. However, the release date of this model was June 9, 1958. 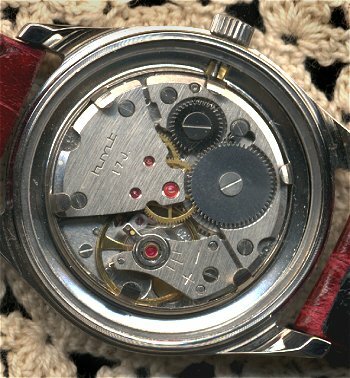 Information from Rene Rondeau’s book, “The Watch of the Future” states that watches produced after May, 1961 were fitted with the Model 505 Electric movement. As my watch has this movement it probably dates from the early 1960s. I have a great interest in the Hamilton watches, and the Electrics are such a fascinating episode in that company’s history. 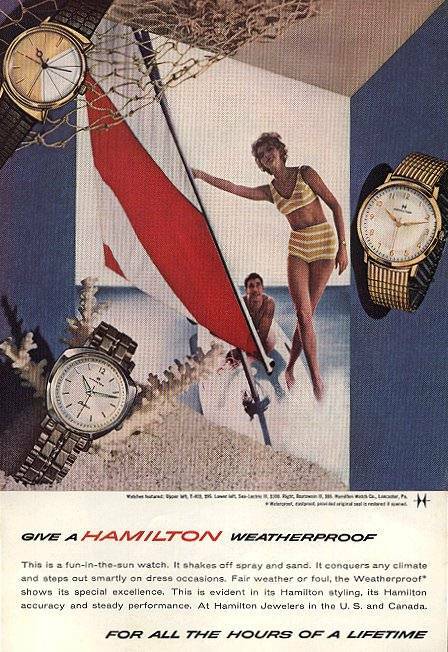 In a nutshell, Hamilton developed the first electric watch movement, the first patent being applied for in 1951. 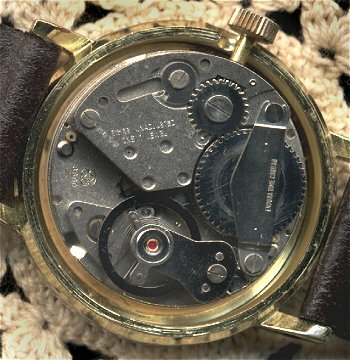 After a long, but eventually rushed development, the company released production watches in 1957, using the Model 500 movement. This movement was very troublesome, the main Achilles heel being the fragile contact wires. This contact system was a problem for the Hamilton workers to manufacture properly, and was difficult to service. Hamilton earned a poor reputation with this movement, both in terms of unreliability with the public, and with their dealers, by not supplying them with product information and taking servicing out of their hands altogether. 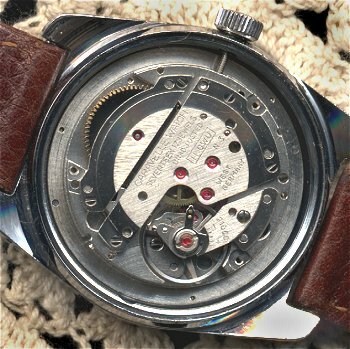 The Model 500 was superseded by the more reliable Model 505 movement, as found in my watch. Unfortunately, with Hamilton Electrics, “reliable” is a relative term The movement is electro-mechanical, with the battery supplying power to generate an electromagnetic field in which a balance wheel/coil assembly oscillates. The contact problem was improved in the 505 but was not fully rectified. The Hamilton Electrics were ultimately not successful, and played a role in the demise of the company. When people think of vintage electric watches they are more likely to remember the Bulova Accutron tuning fork watches, launched in 1960, which proved to be both reliable and accurate. My example of the Sea-Lectric II has not seen any recent maintenance, and runs quite fast, very fast actually (many minutes). These watches can be overhauled and the contacts replaced with gold ones to produce a reliable and reasonably accurate timepiece. You might like to check out Rene Rondeau’s Hamilton Electric website by clicking HERE. His book is available either through the TZ Bookstore, or directly from Rene himself, and is a fascinating read. The watch itself is all SS, and is very solidly made. As can be seen from the scan, the watch has an asymmetric case design, somewhat like a shield. This is one of the more restrained of Hamiltons asymmetric designs, which came to be termed the “Eccentrics”. These pieces are becoming quite scarce in good condition and at reasonable prices. The dial on mine is starting to show its age, with some of the luminous dots having suffered. The design is actually a triumph in creating a slimmish appearance, as the watch is actually reasonably thick (11mm). The Model 505 movement is not in itself overly thin, and the case also has to house the battery. To accommodate this, Hamilton used a bubble back and specially designed the metal movement spacer to fit around the battery. By the way, Hamilton also developed the first watch battery, in conjunction with National Carbon Co (later to become Union Carbide), the forerunner of all watch batteries. 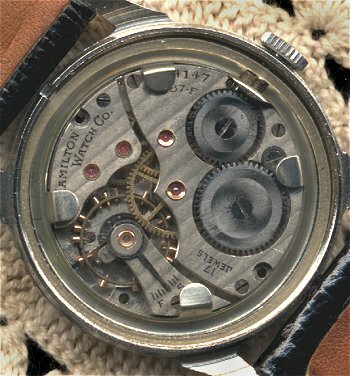 The movement of the second-hand on a Hamilton Electric is interesting to watch. It beats approximately 3 times per second, looking like a cross between a slow beat mechanical, and a quartz movement. Maybe its just me, but it doesnt inspire confidence! I have found the correct batteries for this movement are a little harder to find than normal batteries, and are quite expensive. Owners of Hamilton Electrics quickly learn to pull out the crown when the watch is not in use. This disconnects the power, preserving both the movement, and the battery. Battery life is approximately one year, however, that really isnt a problem these days, as not too many people would be wearing an Electric as an everyday watch. I really enjoy it when I wear this watch. It looks good, feels solid, and is a small piece of horological history, however ill-fated. 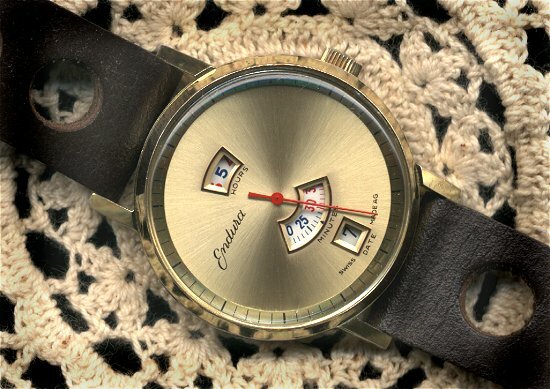 This watch is included due to its interestingly textured dial. Whilst I have seen many textured dials on vintage Bulovas, I have not seen many on Hamiltons. In fact, this is the only example of this particular watch I have ever seen. The movement carries a mid 1940s serial number. The movement is a Hamilton Grade 987-F, which “The Complete Guide to Watches” describes as a 6/0 size, Hunting plate, 17 jewel Double-Roller movement. It is, of course, manual-wind. “splash proof” by today’s standards. I certainly don’t let it anywhere near water. This is a smallish watch, only 32mm in diameter, reflecting the changing trends in what is acceptable as a mans watch. The movement is actually used in ladies small sized pocket watches. The textured dial is quite stunning to behold in the flesh, and the multiple reflections off it can sometimes overpower the gold hands, making it a little difficult to read the time. There are three levels of radiating lines, with the inner two having a guilloche effect incorporated. The sub-second dial is decorated with minute concentric circles. Gold markers, and green luminescent dots complete what is quite a busy dial. This is a current production watch from HMT, an Indian manufacturer. It is included as an example of a brand that doesn’t get too much exposure in the western world. HMT has been manufacturing watches since the 1950s, but the company itself is over 120 years old. A fellow TZer, who is involved in the Japanese distribution of this brand, advises me that the company was established by the English colonial government to supply civilian items, particularly pumps, to the government. Soon the company was manufacturing all sort of light industrial items. Following independence, the Indian government contracted with Citizen to build a watch industry in India, and HMT watches were the result. The factory was designed by Citizen, and all the movements are Citizen movements, built under license by HMT. Quality control is maintained to Japanese standards. 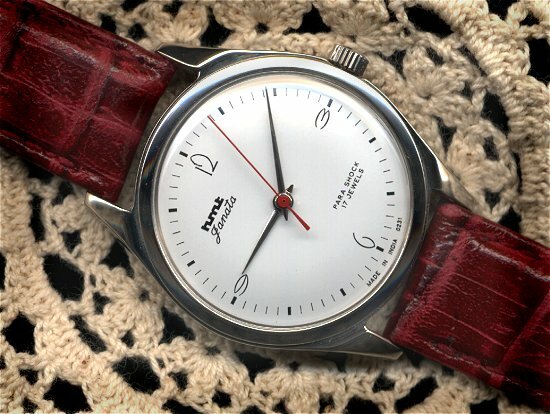 HMT make many variations using the same case and movement, this model being called “Janata”. This is part of a range of watches that are more European in design than HMTs other watches, and are made specially for the Japanese market. They also make a range of automatic watches. The case on the Janata is PNP plated, and the plating is smooth and free of blemishes. It has a SS screwback and is water resistant rated to 3 atm (30m). The crystal is a high domed acrylic, to match the similarly highly domed white dial with printed markers. I was quite taken with the art-decoish look of the watch, and it I think it is quite an attractive piece. The movement is HMTs manual-wind 17 jewel cal.020, and it has proven to be very pleasingly accurate. And there you have it. A look at some watches that are just a little different. Thanks to Paul Schliesser for the Hamilton Ad, and Bill Stonehill for the HMT information.